A facelift, or rhytidectomy, can greatly improve your looks and self-confidence. Facial plastic surgery makes it possible to correct many facial flaws and signs of premature aging. We first discuss your goals and explore your expectations. Dr. Chadwell will help you understand how skin texture, color, personal lifestyle, and overall elasticity will impact your decision-making process. Mini-facelifts can help reverse early signs of visible aging or enhance a previously performed facelift. Mini-facelifts are intended to target aging in the neck and lower two-thirds of the face by repositioning skin to remove sagging and wrinkling. Results are quickly evident and natural, revealing a more youthful appearance. neck lifts are specifically targeted at treating aging of the neck. This is one of the less-invasive options to reposition and tighten the skin and soft tissues of the neck. The results are natural and long-lasting. When the problem is isolated to the neck, this is a procedure that can help to restore that youthful neckline. The inevitability of aging is going to hit and start affecting a person’s overall appearance, especially the face. Over time, the facial skin begins to lose elasticity and starts to sag, which leads to loose, drooping skin in the face and neck. At-home treatments and creams can only do so much. Many turn to plastic surgery to reverse these signs of aging. When we start displaying physical signs of aging, it can be unflattering and displeasing. The agony of getting rid of fine lines, wrinkles, and creases seems ongoing to no avail. Over-the-counter creams, scrubs, and facial masks are no match against the inevitable aging process. Men and women alike want to fight the battle against aging but are apprehensive about surgical procedures such as facelift surgery. The high demand for less invasive and non-surgical skin tightening options has helped open more doors in the facial plastic surgery arena. One of the newest technologies is FaceTite™, which is a non-excisional procedure designed to tighten the facial and neck skin. FaceTite™ can help patients achieve surgery-like results without involving any scalpels or scars. Patients with loose skin on the face and neck that contributes to jowling, folds, and creases may be good candidates for FaceTite™. Patients should be in good health, have realistic expectations, and not have any serious medical conditions. FaceTite™ uses an InMode RF system that utilizes radio frequency assisted lipolysis (RFAL) to produce beautiful results. A probe is placed under the skin surface through a tiny needle hole and used to transmit energy into the tissues. The probe is used to deliver the RFAL energy and precisely control the heat to treat target areas without causing unwanted thermal damage. A tremendous amount of research has gone into developing this technology; therefore, the design of the handpiece allows the exact amount of energy to be delivered to the tissues to generate the appropriate temperatures and achieve optimal results. The device closely monitors temperatures throughout the entire procedure to ensure the safest outcomes. FaceTite™ is a one-step procedure, providing a more concise treatment compared to other laser technologies. The internal radio frequency heat will help promote the reduction of unwanted fatty deposits and improve skin tone and laxity. Patients will notice an immediate improvement in the appearance of the skin; however, full results will gradually evolve over the subsequent weeks to months. The radio frequency energy produces results by coagulating fat, causing contraction of the dermal and subdermal structures and stimulating the production of collagen. Patients may notice some mild to moderate swelling and bruising from the procedure that will quickly subside. Once completely healed, patients will see noticeably firmer skin and a reduction in fat. By having tighter facial and neck skin, patients can enjoy their newly rejuvenated appearance. With a healthy lifestyle and a quality skin care regimen, patients can enjoy their tighter, more youthful skin for many years! Everyone ages, and as time passes on, along come the characteristics that accompany the aging process. The loss of facial volume causes many signs of aging to develop, such as fine lines, wrinkles, and facial creases. Fat transfer to the face is an ideal solution for someone looking to restore a more youthful, vibrant look. The procedure involves the harvesting of a patient’s fat that is then injected into their face to revitalize their appearance. Autologous fat transplantation is a safe and natural process. Since the procedure uses the patient’s own fat, they have no need to worry about allergic reactions. With a short recovery and long-lasting results, patients can minimize facial aging without having an extensive surgery. Patients who want to target facial aging and are looking for an alternative to other rejuvenation treatments may be excellent candidates for fat transfer surgery. It is important that patients have adequate donor fat (typically in the abdomen or thighs) to be used for transfer to the face, are in good health, and have realistic expectations. Dr. Chadwell will examine your facial anatomy and help you decide if fat transfer is the right procedure for accomplishing your goals. During autologous fat transfer, fat is used as a filler material to restore volume to the face. Fat can be taken from any area of the body with excess fatty tissue. The abdomen, thighs, hips, and legs are the most common areas in which people accumulate fat. The fat is removed utilizing a lipoextraction method. Fat is harvested through a small incision using a thin, hollow tube (cannula) connected to a syringe. The fat cells obtained from the donor area are then prepared for fat transfer using a centrifuge to spin the fat or a filtration process that is used to remove impurities. Once cleansed, the healthy fat is placed into small syringes and injected into the designated areas of the face using a needle or a cannula. With each injection, the fat cells are deposited in the natural tissue planes of the face. The process is repeated until the desired correction has been achieved. Dr. Chadwell will give you specific information regarding your recovery. In general, most patients plan to take one week off from work and activities. There may be some swelling and bruising of the face at the injection sites for the first week. By the second week, bruising will subside but minor swelling may still be present. As the fat integrates, the face will begin to look more normal. Within three weeks, patients will be able to appreciate their newly refreshed face and will be able to show off their more youthful, rejuvenated facial appearance. With a healthy diet and proper skin care regimen, patients can enjoy their results for many years! Aging and the sun can take a toll on the facial skin and cause a person to look old, tired, and worn out. Skin resurfacing can be performed to improve the texture of the skin by removing the damaged layers. Dr. Chadwell performs a chemical-based skin resurfacing treatment with a deep chemical peel to achieve dramatic, long-lasting results. Although the downtime is similar to surgery, this treatment provides similar results yet requires no incisions. In some cases, patients can expect to remove 10 years from their facial appearance with skin resurfacing. Ideal candidates for treatment are physically healthy, don’t smoke, and have realistic expectations. Chemical-based skin resurfacing requires a recovery similar to surgery, which makes it crucial that patients are ready and willing to experience an extended recovery time. However, patients will benefit with maximum results. Those with lighter skin tones are the best candidates for this treatment. Patients who have pigmented skin usually do not make good candidates for skin resurfacing treatment. Typically, skin resurfacing treatment is performed under a mild sedative with topical and injections to numb the face. Patients who have anxiety about treatment or fear of the pain may request a general anesthetic; however, it will be more costly. Before the treatment, the face will be cleansed and degreased. Then, the phenol-based chemical solution is brushed onto the facial skin and left for a few minutes. It is normal for patients to experience minor burning or stinging while the solution is applied. The chemical solution is self-neutralizing, and a coat of dense cream will be smoothed onto the skin after the chemical has neutralized to prevent drying and relieve any discomfort. To achieve the best results possible, it is crucial that patients carefully follow the recovery instructions provided by Dr. Chadwell. After treatment, patients will feel stinging and burning for about six to eight hours. Prescribed pain medication or TYLENOL® can be used to control pain. After 24 hours, patients should not experience any pain, but itching, tightness, and moderate swelling will persist. The dense cream is applied liberally over all of the peeled area of the skin and worn for at least one week. The patient will experience peeling and crusting for several days after the procedure that is necessary to aid in proper healing, to prevent drying and crusting, and to keep the areas moist. It is normal for the skin to be pink for four to six weeks after the peel; however, this can be easily covered with makeup. To reduce swelling, patients should sleep on their back and try to keep their head elevated. Patients will need to take antivirals and antibiotics, which will be prescribed to ensure the best results possible and to prevent infection. During recovery, contacts should not be worn for seven to 10 days, and eyeglasses should be avoided for four weeks. Patients should refrain from any physical activities for one to two weeks and from more rigorous exercise for one month. For four to six weeks following the procedure, it is important for patients to avoid direct sunlight, and after this time, they can start wearing sunscreen over the treated skin. Sunscreen should then be worn daily to keep the skin protected from the sun. Skin resurfacing is designed to improve the texture of the skin by removing the damaged layers. In comparison to lighter chemical peels, the deep peel used for skin resurfacing provides dramatic results after one treatment and can allow patients to look 10 years younger. With proper skin care and maintenance, patients can enjoy their skin resurfacing results for many years. Having a weak or receding chin can make your profile look out of balance. It can make the nose look too big or detract from the neckline. Chin reshaping, referred to as Mentoplasty, can correct this with a very quick, simple procedure. An implant is placed in the chin, giving it adequate projection. This gives the chin a smoother outline and brings the face and neck into harmony. Patients can expect to look up to 10 years younger and enjoy their results for many years. The results and how long they last will depend on the patient. Additional surgeries or a combination of other facial procedures, such as eyelid surgery or a brow lift, may be necessary to achieve the best results possible. If you are interested in facial surgery, Dr. Chadwell is an experienced and knowledgeable plastic surgeon who can help you gain a more youthful look. To schedule your consultation, contact us by calling (574) 280-4818 or by filling out our online contact form. Dr. Chadwell believes his comprehensive training and clinical expertise sets his skills apart from other plastic surgeons. 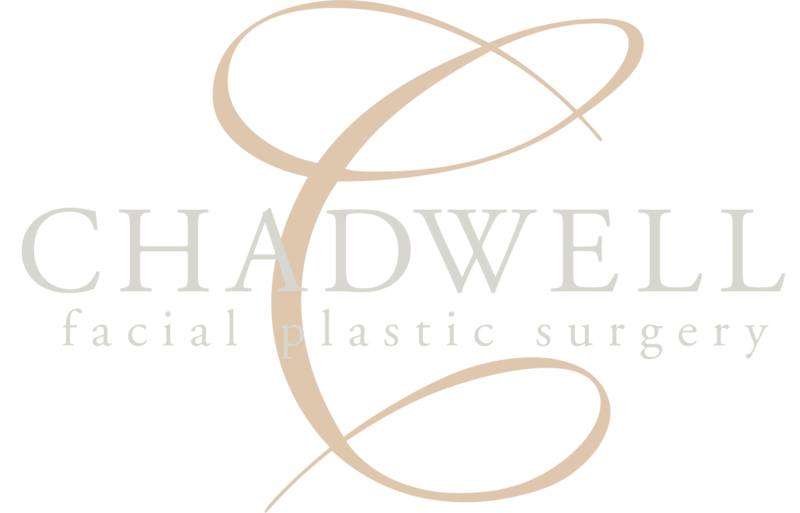 By completing an accredited American Academy of Facial Plastic Surgery fellowship, Dr. Chadwell has the sub-specialty training required to be a Facial Plastic Surgeon. Many facial flaws and signs of aging cannot be corrected with creams, medications, or non-surgical treatments. This is often why men and women opt for surgical enhancements to turn back the hands of time. For visible signs of aging in the face and neck, facelift surgery (rhytidectomy) can be performed to lift and tighten the skin. Ultimately, this procedure can greatly improve your appearance and your self-confidence. Facelift surgery patients can expect to look up to a decade younger in some cases and can enjoy their results for many years to come. Men and women with facial aging in the lower face and neck who want to look younger and more refreshed can undergo a facelift procedure. The best candidate for facelift surgery is a healthy non-smoker with realistic expectations. Traditional Facelift: Incisions will be made within the hairline at the temples that extend around the ears and end in the back of the scalp. The tissues of the face and neck will be lifted and tightened. The skin is then repositioned over the uplifted contours, and excess skin is removed. Mini-Facelift: This less-invasive procedure utilizes limited incisions to target the lower face and neck. The incisions extend from just in front of the ear to under the earlobe and end just behind the ear. Sagging jowls and loose neck skin will be addressed with this procedure. Neck Lift: This less-invasive option specifically targets the aging neck. The incisions are limited to the area under the chin. When the problem is limited to the neck, this procedure can help restore a youthful neckline. Patients can expect swelling, bruising, and minor pain after the procedure. In order to minimize swelling and bruising, a bandage will be placed around the face and neck. During the healing process, clothing that goes on over your head should be avoided, and surgical incisions should not be subjected to force or motion. A compression garment is worn around the face and neck for the first week and then at night for the first month. This protects these areas and encourages optimal healing. Once healed, incisions will be concealed and be barely noticeable. A person who would like to target aging in the neck and lower portion of the face may consider mini facelift surgery as a less-invasive option than a traditional facelift. The mini facelift can help a person reverse signs of visible aging and enhance his or her overall facial appearance. Those who have sagging skin on the neck and lower two-thirds of the face may be good candidates for a mini facelift. The best patients are in good health, do not smoke, and have realistic expectations. A mini facelift is a less-invasive approach compared to a full facelift. Normally, patients have minimal to moderate sagging in the lower face and neck when they undergo a mini facelift. A mini facelift can be performed under general anesthesia, intravenous sedation, or local anesthesia with oral sedation. Incisions are made starting from the hairline above each ear that extend in front of the ear, around the earlobe, and behind the ear. In some cases, a small incision is also used under the chin. Some may refer to this technique as the “S-lift” or a limited-incision facelift. Through these incisions, the skin is elevated and separated from the underlying structures. Sutures are used to pull the underlying fat and muscle up to lift sagging jowls and neck skin. Dr. Chadwell will reposition the skin and soft tissues of the face and neck and remove the excess skin. Sutures and surgical clips are used to close the incisions, allowing the scars to heal and be virtually unnoticeable. Patients can expect swelling, bruising, and minor pain after the procedure. In order to minimize swelling and bruising, a bandage will be placed around the face and neck. During the healing process, clothing that goes on over your head should be avoided, and surgical incisions should not be subjected to force or motion. A compression garment is worn around the face and neck for the first week and then at night for the first month. This protects these areas and encourages optimal healing. Once healed, incisions will be concealed and barely noticeable. Many patients notice results similar to a full facelift but benefit from a shorter recovery and less pain. The majority of patients enjoy their results for many years and are happy with an outcome that looks natural and reveals a more youthful appearance. Many people are annoyed by the wrinkling of their neck skin that creates a “turkey wattle.” When someone has excess pockets of fat under the chin, it can also create a “double chin.” Despite a healthy diet, plenty of exercise, and a proper skin care regimen, sagging skin along the lower face and neck can be unresponsive to even the most healthy of lifestyles. A neck lift involves the surgical treatment of fat, skin, and muscle to improve visible signs of aging in the neck. An ideal candidate for neck lift surgery is not ready for a full facelift and wants to correct sagging in the neck. Additionally, it is important that a patient is in good health and has realistic expectations. Submentoplasty (Direct Neck Lift): A small incision is made in the submental area (just underneath the chin). Typically performed in younger patients or as a secondary procedure. Direct Neck Lift: An incision is made in the submental area (underneath the chin) and on the upper part of the neck in a Z-shaped pattern. Often used in men because it creates a sharp neckline without changing the beard line, hairline, and mouth position. Ideal for those with neck skin that is heavy and has lost elasticity, a significant “wattle” under the neck, and minimal jowling. Posterior Neck Lift: An incision is made behind each ear that ends in the posterior hairline. Scarring is hidden behind the ears and along the hairline. Ideal for those with minimal jowling, minimal muscle bands, and moderate excess neck skin. Through the incision(s), Dr. Chadwell removes and/or repositions the underlying tissues and can also tighten the platysma muscle. Excess fat is removed, and displaced fat is redistributed along the neck and jawline to create the individual’s desired look. The skin is then redraped over the remaining contours, and any excess skin is trimmed. The incisions are then closed with sutures and surgical clips. A bandage will be wrapped around the face and neck to help minimize swelling and bruising as well as to hold the stitches in place. For the first few days, it is important to keep the head elevated as much as possible to avoid the risk of additional swelling. Dr. Chadwell will provide you with specific instructions for caring for the wound and surgical site. Pain medication will be prescribed to control any discomfort. Oral medication may be prescribed to aid in healing and to prevent infections. It can take several weeks to months for swelling to subside entirely, and incision lines won’t mature for at least six months. Once bruising and swelling have dissipated, your final results should show a more youthful and rested appearance. You can expect to feel confident in your skin again with a youthful neck and jawline that improves your overall facial harmony. It is important to keep the skin protected from the sun and to follow a healthy lifestyle to help maintain your now “lifted” and rejuvenated results.